Chic Reversible Slings Discounts Apply ! 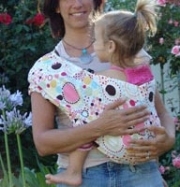 The Reversible Slings are 100% cotton, comfortable, easy to use, machine washable, and very fashionable. Aquamarine - A pretty lime green and turquoise blue paisly print with a reverse side lined with chocolate brown cotton. Black - Simply Black on one side, Simply Tan on the other. Funky Punky - The sling for mom's with a wild side. Featuring black with white skulls and red roses on one side, and mellow tan cotton on the other. Gumball - Pinks, Blues, Greens, and Browns in a fun print on one sign, and a slightly more subtle chocolate brown on the other. Modern Chic - Geometric shapes in Chocolate, Blue, Green and Cream for a trendy look, with the reverse side being a more conservative chocolate brown cotton. Raspberry Truffle - Fun raspberry and chocolate brown pattern on one side, and bright stripes on the reverse. Sizing: To measure for a Chic Reversible sling, take a tape measure and measure from outer top edge of your shoulder, down across your body to the top of your opposite hip bone. If you are right on a number, move up to the next largest size. You may also want to go a size larger if you're close to the top of a size measurement and are large busted, or larger size.